Outlaw Gentlemen & Shady Ladies tells the tales of several different American outlaws and gunslingers of the 19th century. This song tells the true story of the noble lady outlaw Pearl Hart, who held up a stagecoach to buy medicine for her dying mother. Armed with a Colt 44, Pearl netted $430. 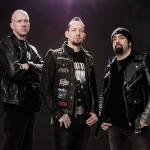 Volbeat vocalist and guitarist Michael Poulsen told BraveWords.com how he learned of Pearl Hart's story: "I started writing those kinds of lyrics and I locked myself into this bubble. It is a process where I read a lot of books and get inspired by movies. When it comes to Pearl Hart, she was a character that I was reading about way back. I had forgotten all about her, but when I started writing material for this new album, I wanted not only to bring up some of the legendary male gunslingers; I wanted to look into the shady ladies as well. I remembered reading about Pearl Hart, so I got back to some of the old books and there she was."